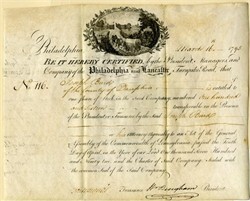 Beautiful stock certificate #116 from the Philadelphia and Lancaster Turnpike Road issued in 1795. 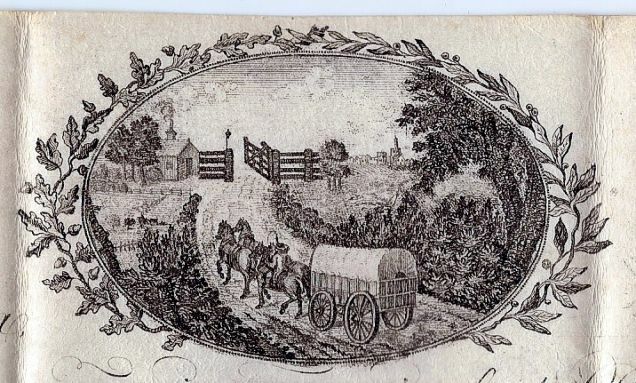 This original historic document was printed on parchment paper and has a vignette of a covered wagon approaching a toll gate. This is also an embossed corporate seal with a covered wagon. This historic item is handsigned by its President, William Bingham and is over 216 years old. 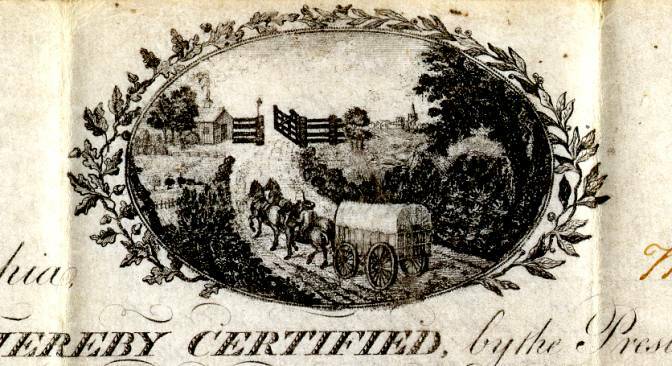 The Philadelphia and Lancaster Turnpike Road Company was America's first private turnpike company and the forth company chartered in the state Pennsylvania (1792). Construction began in 1793 and the road was completed in 1796 and covered a total of 62 miles. This is one of the earliest stock certificates ever issued with a vignette and is highly desirable. The certificate was issued to Joseph Burd. The Philadelphia and Lancaster Turnpike, first used in 1795, was the first long-distance, paved road built in the United States according to engineered plans and specifications. It linked the cities of Lancaster, Pennsylvania and Philadelphia, stretching for sixty-two miles. It was the first turnpike of importance, and because the Commonwealth of Pennsylvania could not afford to pay for its construction, it was privately built by the Philadelphia and Lancaster Turnpike Road Company. It was designed by John Loudon MacAdam, from Scotland, and ground was broken for the project in 1792. The road sparked a national improvement of road conditions after the Revolution, and stimulated economic recovery. By the 1840's, the use of railroads and canals dealt a serious blow to the companies who specialized in the manufacture of wagons and coaches. During the next fifty years, the road suffered from lack of use and maintenance, but later saw recovery with the invention of the automobile. In 1876, the parallel Pennsylvania Railroad bought the turnpike from 52nd Street in Philadelphia west to Paoli for $20,000 to prevent competing streetcar companies from building along it. In 1913, the turnpike became part of the transcontinental Lincoln Highway, and tolls continued to be collected until 1917, when the State Highway Department bought it for $165,000.In 1926 it was designated as part of U.S. Route 30. In Philadelphia, it is known as Lancaster Avenue. William Bingham. (1752-1804) Founded the Bank of America in 1781 and became the richest man in the country. He also served in the Continental Congress and as a Senator from Pennsylvania. Party: Federalist, 1752-1804 a Delegate and a Senator from Pennsylvania; born in Philadelphia, Pa., March 8, 1752; was graduated from Philadelphia College in 1768; agent of the Continental Congress at Martinique, and afterwards consul at St. Pierre, in the West Indies 1777-1780; Member of the Continental Congress 1786-1788; member, State house of representatives 1790-1791, serving as speaker in 1791; served in, and was president of, the State senate 1794-1795; elected as a Federalist to the United States Senate and served from March 4, 1795, to March 3, 1801; was not a candidate for reelection; served as President pro tempore of the Senate during the Fourth Congress; withdrew from public life and engaged in the management of his extensive estates; moved in 1801 to Bath, England, and resided with his daughter until his death in that city on February 7, 1804; interment in Bath Abbey, Bath, England.